Research in a great location. Our urban location puts you within minutes of everything the region offers. Learn about the people that make up CCIB. 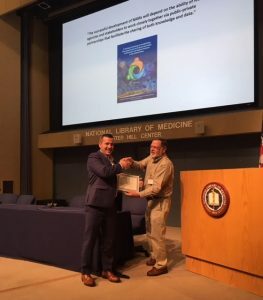 CCIB PhD Student Dan Russo (Zhu Lab) received the 3rd annual Tox21 Student Award at 7th annual ASCCT meeting, held on September 11, 2018 on the National Institutes of Health (NIH) Campus in Bethesda, Maryland. This award was established in 2016 by a longtime ASCCT member and pioneer in toxicology, Ray Tice. The subject of Russo’s talk was “Developing Mechanism-based Animal Toxicity Models: A Chemocentric Approach Using Big Data”. Congratulations! Page last updated by Center for Computational and Integrative Biology at 10:09 pm October 8, 2018 . This page was printed from http://ccib.camden.rutgers.edu/2018/10/08/ccib-phd-student-dan-russo-wins-tox21-student-award-at-ascct-meeting/ at 6:38 AM Monday, April 22, 2019.